It should come as no surprise that the governments and citizenries of many countries show little concern about climate change and its consequences. Behavioral decision research over the last 30 years provides a series of lessons about the importance of affect in perceptions of risk and in decisions to take actions that reduce or manage perceived risks. Evidence from a range of domains suggests that worry drives risk management decisions. When people fail to be alarmed about a risk or hazard, they do not take precautions. Recent personal experience strongly influences the evaluation of a risky option. Low-probability events generate less concern than their probability warrants on average, but more concern than they deserve in those rare instances when they do occur. Personal experience with noticeable and serious consequences of global warming is still rare in many regions of the world. When people base their decisions on statistical descriptions about a hazard provided by others, characteristics of the hazard identified as psychological risk dimensions predict differences in alarm or worry across different classes of risk. The time-delayed, abstract, and often statistical nature of the risks of global warming does not evoke strong visceral reactions. These results suggest that we should find ways to evoke visceral reactions towards the risk of global warming, perhaps by simulations of its concrete future consequences for people's home or other regions they visit or value. Increased concern about global warming needs to solicited carefully, however, to prevent a decrease in concern about other relevant risks. 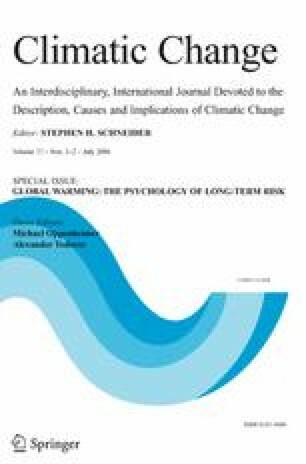 The generation of worry or concern about global warming may be a necessary but not sufficient condition for desirable or appropriate protective or mitigating behavior on part of the general public.